Whenever I attempt to give definition to my initial memories of L’Arpège, I inevitably conjure a young Parisienne who, over ten years ago, was also dining at rue de Varenne and advanced to, and past, my lonely table. Sporting tight jeans and no doubt boots of the same hue as her hair, a dark shade of brunâtre, the passante addressed her precocious eyes to mine and let out a "bonsoir", in that distinctive rising pitch that this species of doe-eyed française alone can emit. To invoke the Proustian proleptic projection, I did not realize then what I know now. I knew that an unscripted, genial encounter of this kind did not occur while I was seated at my table at Ledoyen, but I could not claim to understand the fuller signification of the gesture. I sensed an event of sorts but did not at the time understand the counterpoint to formality that Alain Passard was orchestrating in his mildly cramped dining room, did not quite grasp how the undulating waves of the wooden paneling might signify the refusal to “play straight” by the rules of Parisian haute cuisine. Is there a French chef of the 21st century who has done more to jettison the hallowed conventions of the Classical French restaurant than Passard? What I admire is that the iconoclastic gestures are primarily effected towards reinvigorating the pleasure of eating in a convivial environment, rather than towards gratuitous statement. When he cuts his roast to include the offal or when he serves a simple ratatouille of vegetables, he lifts the inhibitions of Classical restraint and overly sublimated dishes. 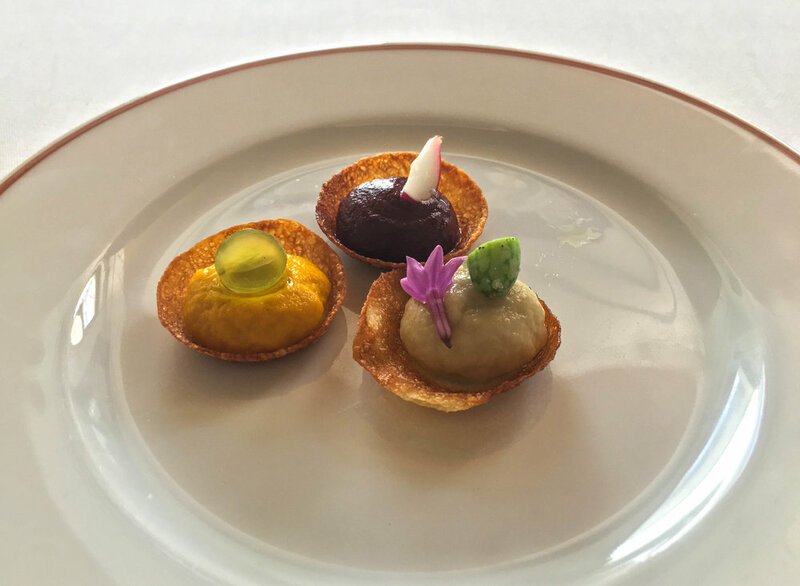 To give an indication of this overly sublimated cuisine, if you dine today at a storied Swiss institution of French Gastronomy like the Restaurant de l’Hôtel de Ville de Crissier, under Giovannini, you will taste an excessively manipulated cuisine that emits all the signs of gentrification. Giovannini’s dishes are visually impressive for those who marvel at the possibilities in decorating a plate with diminutive cuts and precise squirt bottle designs. Mussels will be minced until they are unrecognizable and buffered by an incongruent julienne of carrots, and the chapeau of the famous soufflé will be lifted to your plate before the rest of the ramekin is ushered away, because the settled butter would pose the significant health hazard of being enjoyed. Passard is the contrary, he does not lighten his food to appeal to the widest swathe of contemporary tastes or rework textures to wow the Instagram set (excepting his unfortunate beet sushi), but ultimately has the maximization of gustatory pleasure in mind. Similarly, when you are greeted by the L’Arpège service staff who are courteous but not stilted, and representative of the multicultural medley of Paris, you naturally loosen up in such a vivacious environment bereft of pretense. This same casual-elegant état d’esprit extends to the cuisine. Since overtaking the garden estates in Normandy, Passard has in some ways relegated the discrete dish to the background to hone his focus on the spontaneous presentation of the incomparable produce. These two lunches arrive a decade after I had enjoyed a few meals here. As in those previous meals, what I most appreciated about Passard's cuisine is the beguiling myriad of color, fragrance and flavor that wash over you during a meal here. I cannot think of a single restaurant in Paris, perhaps in France itself, that elicits the salubrious feeling of tasting the colorful and delicious food in a dining room which radiates with the changing light reflecting off of rue de Varenne. L’Arpège’s appeal is rarely about a single dish (though they can occasionally astound), and it is neither about meal progression. There will be a few dishes that manipulate the garden produce very little; a few which are composed, such as the vegetable pastas; and roasted dishes that can achieve breathtaking heights if the cuisson is correct that day. There will be a couple of magnificent highs and a couple of baffling lows. Indeed, I do not believe there is an haute gastronomy kitchen in Paris with such inconsistency as L’Arpège. Admirers tend to fall for it like a lover, rather than esteem it like a restaurant, and it appeals to those for whom its capriciousness and flaws constitute its character and charm. A unique pleasure chez Passard are the welcoming vegetable mousse tartlets with a coupe de Champagne. The cup crust may not always be cooked to the right color/texture but the mousse’s flavors are always bright, intense, and smartly garnished with crunch or acidity. This visit, they were serving a rosé saignee from Larmandier-Bernier, and I recommend afterwards that you follow the very capable sommelière, Anaïs, who is meticulous about wine pairing and will consider the dish components carefully before advising. She chose for my first lunch a good Jura savagnin/chardonnay blend, cuvée d’Automne from Domaine de la Pinte, that was not overly oxidative for the first part of the meal and still an ideal marriage with Passard’s lobster vin jaune. It made me ruminate on how well Puffeney cuvée Sacha would perform here if it were on the list! Amongst the composed dishes chez Passard, there are the canonical ones such as the gazpacho with moutard d'Orléans ice cream or the more recent fine ravioles in a seasonal vegetable dashi. Both dishes manage to convey intense flavors while remaining ethereal on the palate. The broken mustard’s acerbic edge is mitigated by being reduced to the temperature of ice cream but precisely to seamlessly marry with the gazpacho. Passard is given to thinking in metaphors which are more deeply conceived than mere trompe l’oeil theatrics, and one cannot but see his gazpacho moutard d'Orléans as a savory zuppa di fruta con gelato. Likewise, the fines ravioles reconceives a Japanese dashi with the umami of tomato, in place of katsuo, and the tannic structure of verbena, in place of kombu. I found the dashi slightly miscalibrated toward the herbal but otherwise this is a masterpiece. The vegetal intensity and precise cuts of the vegetables inside the ravioli fillings must be tasted to be believed. Other of Passard’s metaphors, like the vegetable nigiri, make partial sense in that a beet does evoke the reddish irony/earthy flavor of maguro, but there is no satisfying textural synthesis between a beet and the sushi rice. It is a rare dish where you feel Passard has allowed Instagram and gastrophysics-inspired mimicry to supersede gustatory pleasure. In addition to the gazpacho and fines ravioles, I am mesmerized by the vegetable pastas at L’Arpège. They are not experiments in texture for its own sake but instinctively highlight the vegetable’s unique pliancy and flavor. In winter, the celery root tagliatelle with moutarde d'Orléans is redolent of an elevated remoulade. On this summer visit, the spaghetti aux pommes de terre not only resembles a carbonara with the cubes of smoked eel that replace the lardons and the Côtes du Jura emulsion that one associates by metonymy with a salty Comté, but the mineral accent of the potatoes shows the unforeseen potential that has been lying dormant for this dish. Anaïs wisely chose a flinty Puligny-Montrachet premier cru, Domaine duc de Magenta “La Garenne” to match the minerality of the potatoes and the white peppery-savory savagnin emulsion. This was conceptual and intuitive, using great ingredients to create dense flavors and yet lithe textures. A confluence of such factors is rare, and that is why imitation of Passard is perhaps misguided. Finally, you can order conservatively with the lobster vin jaune, turbot if it is season, or take your chances on a roast. 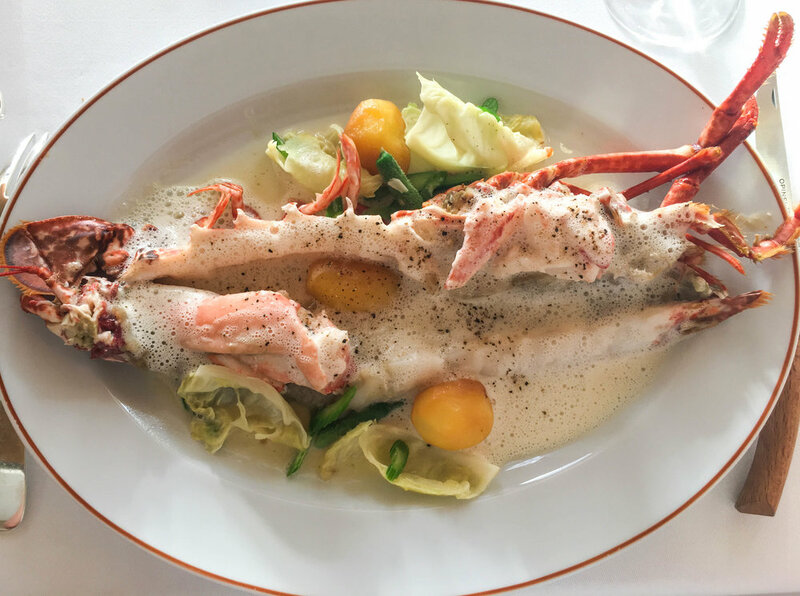 Passard’s homard vin jaune is a riposte to Classical sauces of French Gastronomy, cut longwise in “aiguillettes” to include the liver flavored tomalley of the head. The vin jaune emulsion may appear overly casual but its oxidative notes coalesce with the raw and deep flavor of the tomalley. 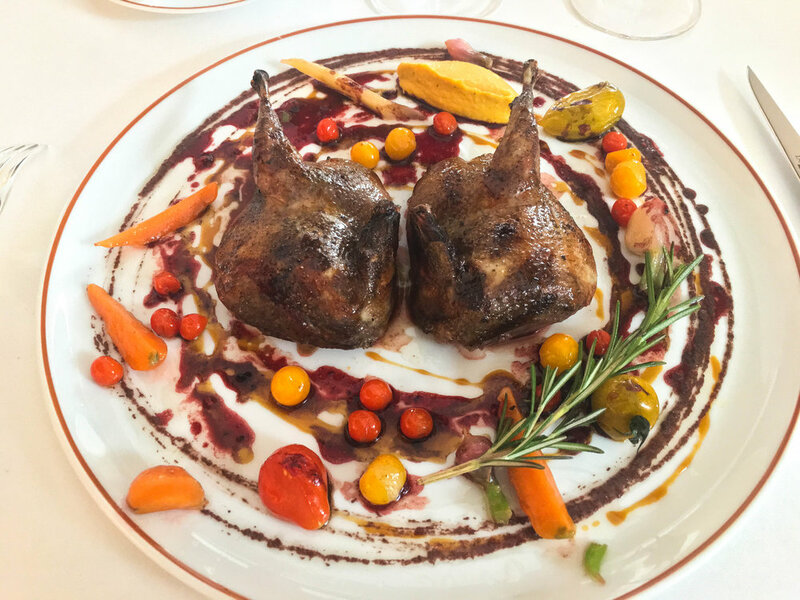 Likewise, Passard is known for both his roasts and offal, but even when he simply roasts a pigeon to a uniformly rare cuisson, he astounds you with the sweetness of a vegetal medley and carrot purée that will make you revisit any mostarda as pedestrian and monotone. The pigeon is easily one of the most satisfying main dishes I have tasted this year and a perfect expression of the vegetable medley performing wonders. Neither of these dishes are conceived in the same painstaking way classical French chefs conceive dishes with precise rapports between ingredients and harmonized by the binding effect of a sauce. They might be characterized as haute bistro cuisine but because the ingredient quality is exceptional and the only manipulation serves to heighten the intensity of the flavors, they can achieve the same impact as analogous dishes by Le Squer or Pacaud (though I would not hesitate to give the nod to the best versions I’ve tasted of L’Ambroisie’s homard à la sauce diable or au romarin avec de pommes de terres nouvelles). Unlike these Classical chefs, Passard applies vegetable medleys and emulsions across his repertoire. In its movement away from the discrete dish and towards a casual style of haute gastronomy, L’Arpège's cuisine is less given to composition and rehearsal as at Fréchon’s Épicure and more to the repetition of broader themes, as in minimalist music. Of course, the minimalism of Passard is more conducive to working with his changing daily harvest from the biodynamic garden estates than would a more baroque and finely detailed cuisine. Moreover, I sense that Passard’s vegetable medleys are not indiscriminate or a result of laziness but rather aimed at preserving the pleasure of vegetal texture. Thus, his ratatouille or couscous may appear untamed by haute cuisine conventions, but both juxtapose the myriad textures to pleasurable effect, each vegetable a foil for the other in terms of color, flavor and texture. The flavors and aromas are not sublimated through manipulation, just as gargouillou does not promote one ingredient over another but allows each to shine through individually. Like gargouillou, the vegetables of Passard's ratatouille are not stewed together but benefit from their own distinct method of cuisson and cut. Because these dishes do not weigh you down with butter or cream, and are dressed only with some very good Parmesan Reggiano or harissa and argan oil, the intensity of the dish derives from the full gamut of mineral, nutty and sweet flavors of the old-world vegetables. As with great Old World wines, it is almost as if manipulation of the vintage’s bounty would spell the mitigation of deep vegetal/earthy notes that are uniquely present in European produce. However, in other instances there is a disappointing aspect to Passard’s absence of dish composition. If the repetition of vegetable medleys and emulsions are used to a unifying, binding effect, in other more minimalist dishes, the chef’s intention seems all but effaced by the rote juxtaposition of ingredients. These cases can be frustrating in that ingredients may be combined with a rapport that does not suffice to unify the dish. Because Passard is bound by the la récolte du jour et de la saison, his brigade must be forced to improvise with substitute ingredients if the recipe calls for an element that is out of season. Pacaud also replaces supporting elements according to season (pommes de terre nouvelles for potimarron et petits pois) but always with the totality of the dish in mind (bisque au romarin will replace sauce diable to accord with the change in ingredients). Passard, on the other hand, may add a supporting ingredient that coalesces with but does not complete the dish. Thus, in August they will send out a sweet onion gratin with girolles where the flavors coalesce but there is no textural contrast, as chestnuts would provide optimum foil in winter. The dish feels unfinished or unwrought. I sense that only with vigilance in the kitchen could Passard avoid such pitfalls of a cuisine that has eschewed painstaking dish compositions. However, while he can still be spotted greeting tables at the end of your meal, he also spends a considerable amount of time catering to the gastronomy scene and to lunches at his garden in Normandy. Another facile combination, the summer millefeuille was in a sorry state. While I have fond memories of the vanilla millefeuille, this overburdened one seemed to be leaning over in exhaustion. It demonstrated scarce technical intervention and instead felt like a brute exercise in achieving seasonality. Made to support full berries and oddly, even torrone, the mid-layer leaves had yielded to the weight and moisture while the topmost layer was overly thick and condensed. Misconfigured as such, Passard’s characteristically overbrowned leaves, for which I am normally an apologist, did not shatter to impart a tannic counterpoint to a sweet cream, the version I recall fondly. (I am told the chocolate millefeuille can be available on request in summer, which I recommend instead.) There is now a gratuitous line of caramel outlining the plate, a repetition of the pool in the equally disastrous tomate farci dessert that was so sweet that I could only suffer a few bites, even after mitigating it with the very good basil ice cream. On the other hand, I always look forward to the modern garden-based mignardises with a coffee or Armagnac. 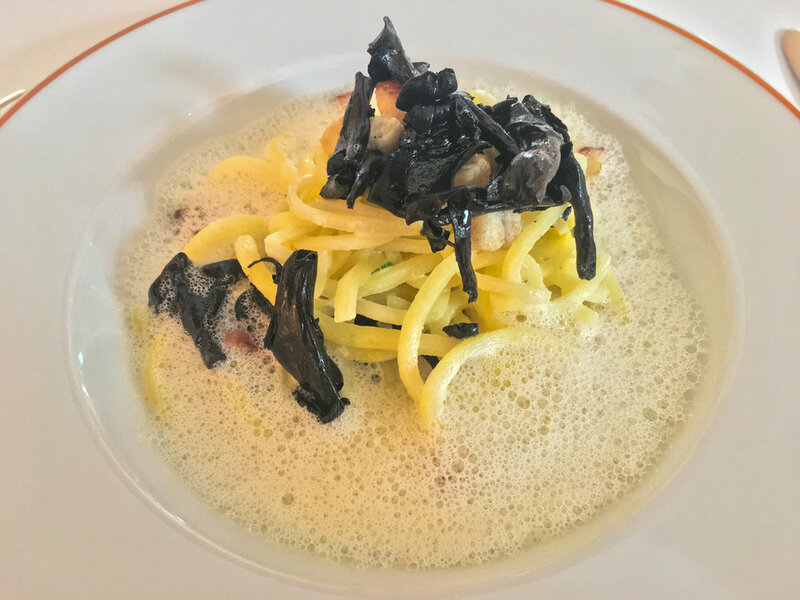 Ordering at L’Arpège is not so obvious, for while the daily tasting or garden menus will no doubt offer some unscripted surprises, they are just as susceptible to unwrought dishes or a succession of radishes. That the highs and the salutary feeling of dining here can make these shortcomings worth the gamble is a testament to Passard’s continued ability to orchestrate intermittent moments of ecstasy. If you are like me, you may want to lean towards micromanaging your meal to yield higher chances of satisfaction. Perhaps the subtle art of dining here is in learning to balance faith and intervention.